BasketUSA new design › juxy . : design consulting agency :. 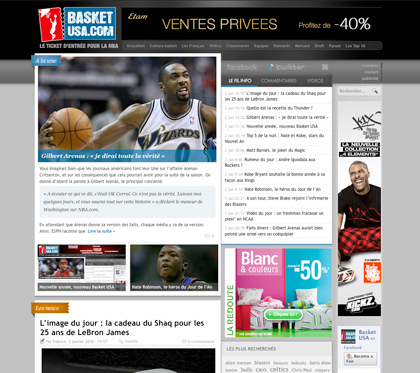 At the beginning of december, BasketUSA (one of the most busiest basketball website in France) contacted us for a new design. The brief was easy: modernize the design, bring some new functionalities… by keeping the spirit of the previous website (for not disturbing visitors habits). Give a fresh look to the design by keeping in mind User eXperience and easy-navigation aspects. Develop in a rigorous way (CSS, XHTML, js, jQuery) for optimizing server requests and manage WordPress integration for high-traffic website. 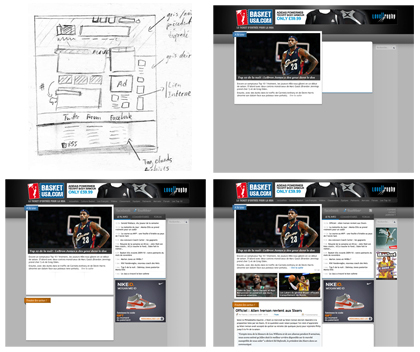 First visitors feedbacks (link) are great and we hope juxy’s work will help BasketUSA improve its community experience. We asked juxy to design our corporate logotype and business cards. Throughout this project, we really appreciated his focus and ability to catch and render the personality of our company. The result perfectly matches our expectations and is very representative of our corporate identity.